^ 1.0 1.1 1.2 Betancur-R, Ricardo; Wiley, Edward O.; Arratia, Gloria; Acero, Arturo; Bailly, Nicolas; Miya, Masaki; Lecointre, Guillaume; Ortí, Guillermo. 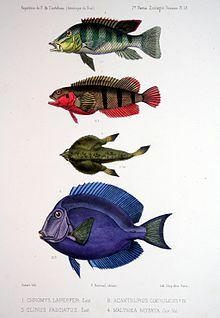 Phylogenetic classification of bony fishes. BMC Evolutionary Biology. 2017-07-06, 17 (1): 162. ISSN 1471-2148. doi:10.1186/s12862-017-0958-3. ^ Palmer, Douglas. The Marshall Illustrated Encyclopedia of Dinosaurs & Prehistoric animals. London: Marshall Editions Developments Ltd. 1999. ISBN 3至8290至6747-X. ^ 3.0 3.1 3.2 Benton, Michael J. Vertebrate Paleontology. London: Chapman & Hall. 1990. ISBN 978-0-412-54010-3. ^ Ben Waggoner. Telostei. Museum of Paleontology, University of California, Berkeley. 1995-07-17 [2006-06-08].